I imagine, when you’re as famous and frequently observed as someone high-profile like Beyonce, Adele or (dare I say it,) Justin Bieber, that it’s a feat ‘directly under impossible’ to avoid gossip and unfounded chatter about any facet of your life; career related or not. Scandal after scandal can be thrown out there for all eyes and ears to take note of and there’s never any taking those accusations out of circulation once they’re thrown. Thing is, what about career related scandal? There have been stories that manage to rise to newspaper and TV level in the past; bouts of (failed) lip syncing often being played out. (excuse the pun) Outside of musicians though, it doesn’t seem as prevalent that we hear gossip of such undeniable proportions. That’s most likely because other performing art mediums don’t have as easy of a way to blatantly deceive others with a skill they might not have. If you’re live on stage and dancing with a troupe, you are either going to do the same movements or stick out like a sore, unfitting thumb among accomplished ballerinas. Once this subject has been breached, the seemingly immortal discussion of extremes rears its head once again. During this particular moment, my only major question is “why not?” The situation that prompts my question shows just how limited the scope of talk can be among people whose near-entire focus is simultaneously their career and not spontaneous pregnancy or having 3 affairs in one year. La Scala, or Teatro alla Scala, as it is called in Italian, is the famed Milan opera house and ballet theater, whose doors opened back in the late 18th century. 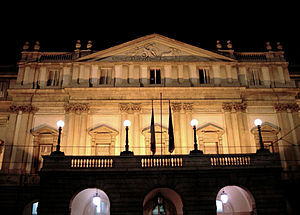 To attend a performance at La Scala is the dream of many, as its performances and performers alike are amply revered and applauded throughout the world. The reputation of both is long is standing and high in placement. This being the case, when La Scala ballerina Mariafrancesca Garritano took an unabashed stance in stating that her training with the theater prompted a development of “severe body dysmorphia and eating disorders, [wherein] one in five ballerinas now suffer from anorexia,” (Cit. HERE) suddenly the administrative higher ups have an open can of worms to deal with and a potential stain starting to set on the pristine image of this performing arts institution and all of its affiliates. Such news isn’t far off from the hollywood laced derivatives brought up in the Black Swan, which I talked about HERE. If we were to stop here, it’d be a case of ‘wrongs having been righted’ and the ‘past is the past’ and we’d wash our hands of it. As it is, I’m personally inclined to go with that bandwagon for the time being. Even within her statements to the guardian, Michele Villanova, a dance colleague of Garritano’s who was a “senior dancer [with] La Scala between 1986 and 2010,” (Cit. HERE) really didn’t present an opposing case in terms of recent relevancy. I know it would cost money and energy but if La Scala prides itself on being a top figure of the performing arts world, why not take the lead position and let people who feel the need, poke and prod dancers’ routines; if for no other reason than to show there’s nothing to hide? The dance world isn’t without its anorexic skeletons and what better way to stick a hand up in the face of those poor choices than to show fully exposed, how upstanding La Scala’s dancers are.